Bib number is personal and it cannot be given or transferred to another person. In case of a misuse, the runner might be disqualified from the race. The bib number must be attached in front of a shirt and be visible during the whole race. Runners not wearing bib numbers will be removed from the running route. Every runner must fill in ICE (In Case of Emergency) phone number and personal medical information at the back side of the bib number. Remember to fold and remove the separation letterhead part of the bib before use. If you use HCRD luggage service, you can give the smaller luggage tag with your number on it to the personnel at the luggage service and make the service faster. You may pick up your running number, t-shirt and gear bag at the Competition office during the opening hours. Organizer has the right to determine annually timing system and used technology for each event. Participants must obey the organizer´s guidance to use the system correctly. Runners who does not comply with the instructions, does not promise official time and result. Helsinki City Running Day timing system works with bib tag attached to the bib number. Bib number needs to be attached to the front of the shirt, so that it is clear and visible. Bib number is personal and it cannot be given or transferred to another person for safety reasons. Gross time (from firing of the gun to crossing the finish line) is the official result of the race. Also so called the net time, time from crossing the starting line to crossing the finish line, will be given for each runner. Garmin Helsinki City Marathon entry fees are non-refundable in every case. The runner does not need to inform the organization about possible cancellation before the race. A bib number is personal and should not be given to another person. It is however possible to transfer the participation to a new runner with a re-registration fee of 10 €. 4. You see a confirmation “Are you sure…” message, where it tells the person what the transfer fee / value is. 6. Copy the code and save it well. NOTE THIS! The profile becomes deactivated right after the code has been created. 8. You can now give voucher to person whom you want to transfer the participation to. 9. New entrant does the online entry as a new participant. He/she uses the voucher and pays the transfer fee of 10 EUR. If you are already registered in an event 2019, but you’d rather take part in another event the same day, please send us email: maraton@sul.fi. You will get instructions to pay the price difference between the events. If you want to change it to cheaper event we will not return the price difference. You can change to a shorter distance by logging into your personal running profile. 9am-8pm (9-20) Garmin Helsinki City Marathon, Helsinki City Run, Helsinki City Marathon relay, Helsinki City 5, Helsinki City Double and Norlandia Minimarathon competition office and Running Expo area is open at Töölö Sports Hall (Töölön Kisahalli, Paavo Nurmen kuja1) A-side of the hall. Entrance is located at the eastern side (the parking area’s side). The running bib has to be picked up during the opening times of the competition office, the bibs must be picked up at least 1,5 hours before individual starting times. T-shirts must be collected from B-side of Töölö hall (B-hall). In addition, the t-shirt is available only before the event. Please note that you need to know your bib number before picking it up. Another person may pick up the bib and the t-shirt on behalf of the runner. In that case, please give your running number information to the person picking up your race package. 7:30 am Norlandia Minimarathon Competition office opens at Eläintarha Athletics field, Note the different location than on Friday! 11.15 am Helsinki City Run’s the first starting groups are ready in the starting area on the Mäntymäki field (Mäntymäentie). 2:45pm (14:45) Garmin Helsinki City Marathon’s and Relay’s (1st leg’s) runners ready at Mäntymäentie. We recommended to use public transport as we don’t have any reserved parking areas for the runners. During the event 17.-18.5.2019 the competition office is located at Töölö Sports Hall (Töölön Kisahalli) A-side of the hall (A-halli). The address: Paavo Nurmen kuja 1, Helsinki. Entrance is located at the eastern side (the parking area’s side). If you need to drop out of the run, there is transportation organized from the route to the finish area. Contact the closest service station. Your pickup will be organized from there. There are checkpoints to control the time along the route. The maximum running time must be met also at the checkpoints. Participant is noticed to have discontinued the race if he/she does not arrive to the finish line within the maximum time or he/she does not arrive to the refreshment point within the maximum time of the race. A runner who stays behind the control personnel continues the run at own risk. A runner short cutting the marked route, disturbing other runners, or not following the rules and regulations stated by the organizer will be disqualified from the race. His or hers participation right for other Finnish Athletics’ events might also be denied in the future. For the foreign runners living outside of Finland, the race organization will send the entrant information by email. Please make sure that the race organization has your correct email adress in order to receive the information email. You can easily update your email and other registration information at your personal profile page. Username and password is sent to runners email with the registration confirmation email. ADDRESS INFORMATION and HCRD-MAGAZINE (posted only to addresses in Finland) For the runners living in Finland, the race organization will send the HCRD-magazine with race info to their home adress. If you live in Finland and wish to receive the magazine (written in Finnish) make sure the race organization has your correct adress. Runners can easily update their registration information at the personal profile page. Username and password is sent to runners email with the registration confirmation email. During the event lost and found items are returned to the Competition Office’s Info desk. 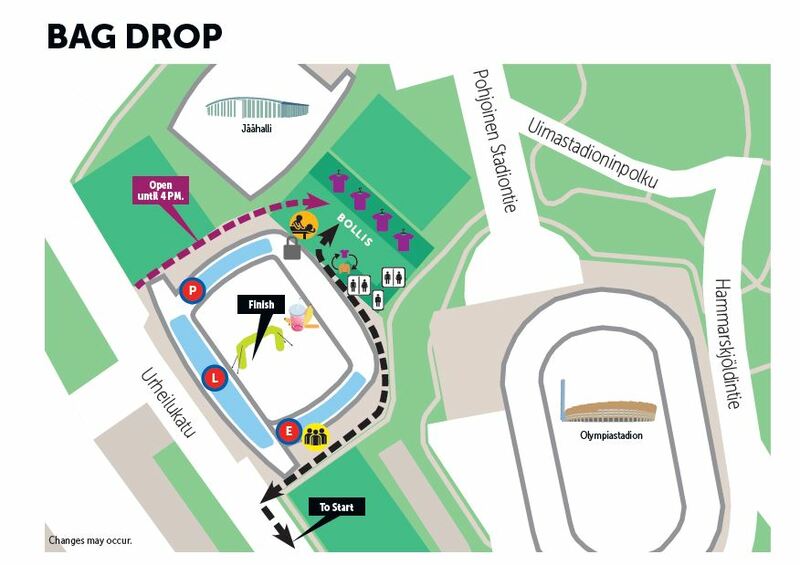 The runners will have free entry to the Swimming Stadium after the race, where the showers are located. At the Telia 5G Areena, spectators can use the main tribune (on the Urheilukatu side) and the Southern and Northern stands to cheer the runners. Telia 5G Areena restaurants are open for public use during the event. The equipment storage is located at the Bollis 6, next to the Telia 5G Arena. It’s open 9 AM-9:30PM (9:00-21:30) on the event day. The gear check area will be guarded. Only runners wearing a bib number can leave and pick up their bags there. All the goods left to the storage need to be put inside of official HCR / HCRD gear check bag given at the race office. Remember to add your bib number sticker to the gear check bag! 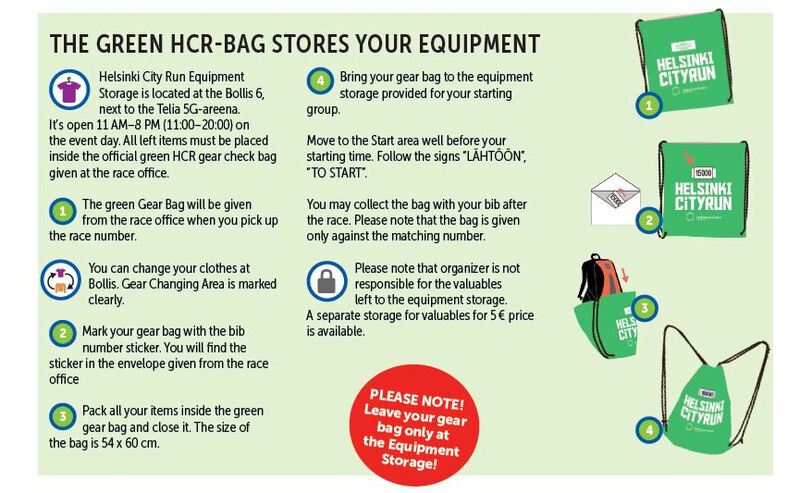 You may collect the bag with your bib after the race. Please note that the organizer is not responsible for lost items. A separate storage service for valuables is recommended for items such as wallets, cell phones, and watches etc. Read more about equipment storage for Helsinki City 5 and Marathon Relay in the specific info about events. Small valuables that fit a normal sized envelope (phone, money, watch etc.) can be left to the storage for valuables during the race. The storage is located at Bollis 6, right next to the changing area. The storage for valuables is open on Saturday from 9 AM to 9:30 PM (9:00-21:30). The cost of the storage is 5 € (cash only). Please reserve enough time and if possible exact change. Helsinki City Running Day Expo area is attached to the Competition Office. You may purchase sports equipment, products and other services provided by the partners there. It’s open May 17-18th at Töölö Sports Hall (Töölön Kisahalli), address: Paavo Nurmen kuja 1, Helsinki. The venue for HCRD 2019 official after party is Apollo Live Club (address: Mannerheimintie 16, Helsinki). By showing the HCRD medal the runners will have free entry (does not incl. cloakroom) before midnight on May 18th 2019. Age limit for the after party is 20 years. See instructions on how to order a gift card below. There is no reserved parking for the runners at the event area at Telia 5G Areena. It is recommended to use the public transportation to get to the event. 1. Take a parking ticket at the entrance barrier. 2. When leaving, enter the parking ticket into the pay station. QR code in place until the pay station registers the discount. 4. Pay your parking either in cash or by payment card. 5. Take the parking ticket with you! Please note! The discount is granted only using the QR code when paying for the parking at the pay station. barrier or if the parking is paid directly to the hotel. EuroPark does not reimburse discount in arrears. The runners that belong to the Finnish social security system (KELA) are insured for acute illness and injuries sustained during the race on May 18, 2019. The insurance is valid from the time the runner enters the start area to the time the runner has left the marked finish area. If the participant needs to use the insurance, he/she need to contact the official medical services at Helsinki City Running Day first. The insured runner is responsible for the cost associated with the medical treatment first. Please note that participants not belonging to the Finnish Social system run at their own risk. See more information about the insurance from Finnish HCRD website. During the event, our photographing partner will take pictures of runners before, during and after the race. All pictures taken will be available online after the event only for runners who have given their permission to photos while registering to the event. There are several refreshment stations along the route and one at the finish area. 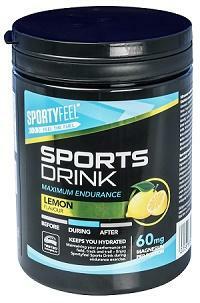 Along the route, the refreshment stations serve water and Sportyfeel Sports Drink (lemon taste) 5%. Unfortunately, due to large number of participants, special diets cannot be taken into consideration. Medical service can be contacted from all the refreshment stations along the route and at the finish. Medical staff is available along the route. In case of an injury, an illness or other reason, which forces you to discontinue the race, please contact the nearest event official. Recovering massage is available from 12:30 am – 9 pm for runners after finishing. The massage is located behind the Telia 5G Areena, next to the Bollis 6 field. See the start list for Helsinki City Running Day 2019 here.